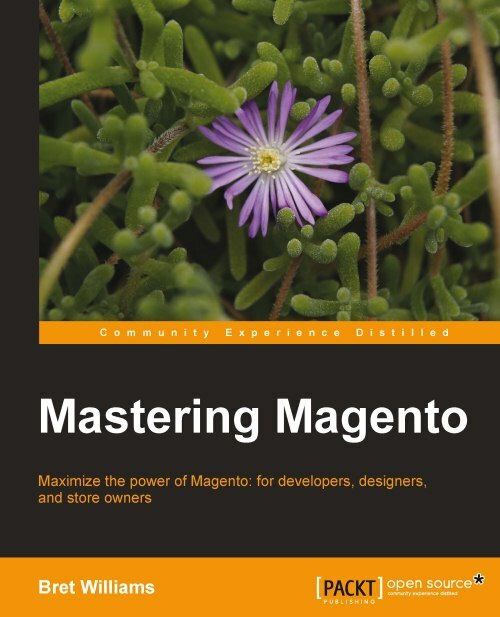 Mastering Magento is a book written by Bret Williams. It's in English and it has 300 pages. This books walks you through how to customize your Magento store for better performance, tuning your Magento installation and step-by-step guides for making your store run faster or to improve your conversion. I'm not going to lie to you, you might need developer skills to be able to understand some parts of the book. However, most of the book can be read without technical knowledge. You'll be able to comprehend most of information which might help you improve your store and learn how to configure it. This book covers every chapter in-depth. You can get your hands dirty on code, server setup and a lot of Magento Admin tuning. Each section will also give you an explanation of the elements involved such as catalog fields, scope, attribute sets and more concepts. What did I not like about this book? I might have liked to see more code such as extensions but maybe that's because I'm a developer. Still, if you want to learn about coding extensions and snippets I'm sure you can find similar code focused eBooks. 4.787.554 post views so far. This page needed 42 queries to load.